Love the Warriors. Have all the figures Mezco has put out. The deformed, and 8" articulated. My question is why are they making the vests with the flaming cobra? The actual screen vests have flaming skulls. The 1st deformed figures had them. But the 8" and now these have the cobras. Does mezco not have rights to the vest logo??? Can someone explain this, or am I wrong?? I have a vest replica and its the skull. HMV - a UK store - recently released a 'VHS' Blu Ray edition, it included the Blu Ray and the DVD, plus a small poster, sticker and trading card - all in VHS style packaging. The DVD that came in the set was the original cut. 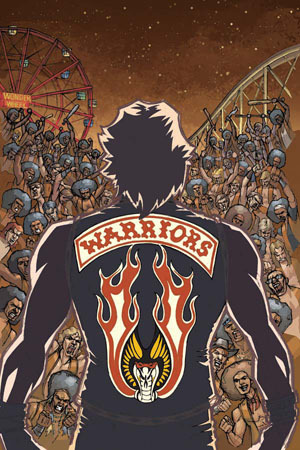 I love the Warriors and it's cool seeing more action figures but it gets annoying when they don't make the whole gang. It's always just Swan, Ajax and a couple Baseball Furies. Come to think of it I'm shocked Luther or Masai doens't have a figure in this line.